Pope Francis made a few other Marian references today. 2. The Vatican Information Service reports that “At the end, after the [Inauguration] Mass, the Pope went to pray before the statue of the Virgin that stood next to the altar.” Pope Francis consistently is revealing himself to be a man truly dedicated to the Virgin through his various prayers at different Marian sites (e.g. St. Mary Major, Lourdes Grotto, Statue next to the altar). 3. 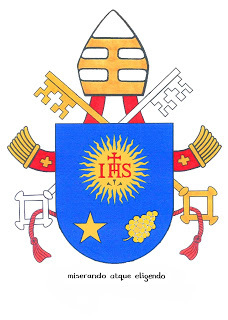 Like many of the Holy Fathers (and bishops for that matter), Mary typically finds a place in the coat of arms. For Pope Francis, Mary is represented by a star. St. Bernard of Clairvaux in his homily In Praise of the Virgin Mother states that the name of Mary means star. In Catholic piety we call Mary the Star of the Sea, or the Star of the New Evangelization. Zenit has a nice piece on the Pope’s motto having both a Marian and Joseph dimension.